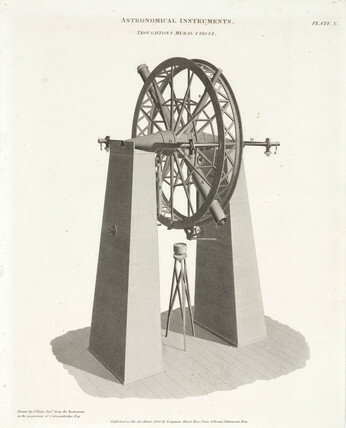 Print of 'Troughton's Mural Circle', an astronomical instrument. The engraving, taken from 'Rees Cyclopedia' published 1812-1820, shows a transit circle built by the London instrument maker, Edward Troughton (1753-1835). Stephen Groombridge, a London merchant, commisioned this instrument and used it to compile a catalogue of north polar stars. Such was the accuracy of his work, Groombridge's catalogue was still of value well into the twentieth century.